It was a cold and dark weekend afternoon, but Chrish and Fred really toughed it out for this amazing engagement photo session we did in New Westminster. They both have such warm personalities that I wasn’t too surprised at how natural they looked in front of the camera. 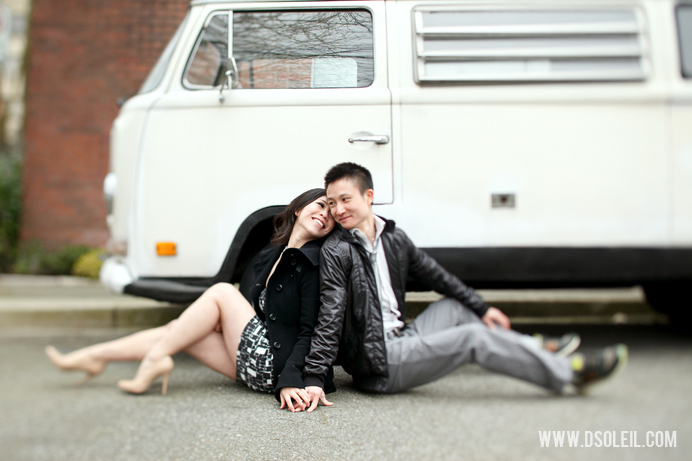 We pretty much had the whole city to ourselves as most locals hid indoors, but Christianne and Fredrick didn’t let a little chilly Vancouver weather get in the way of a great photo session. Ok, so they withstood the cold without a single complaint, now let’s pray for sunny and warm weather for their upcoming wedding this year. I really love that first one, looks like an awesome tilt shift. And the bokeh on the second is very nice. Really nice! I really like the soft pastel colour palette. Great work! Love the tilt shift in the first one. Nicely done. good work, must say i love the first one a lot! Killer T/S shot. Wonderful poses with a cute couple. Digging that VW van too! more more more! Good tease. Oh, I adore that first one!! Fabulous work! Can’t wait the for full the post. Thanks for toughing the cold weather out with us, Daniel! We had a great time, and New West turned out to be an awesome suggestion, with so many memorable spots for cool pics. We’ve never been the subjects of a shoot and you definitely made us both feel very comfortable. We’re looking forward to seeing the rest of the pics…you had so many creative ideas. Can’t wait!